SA’er Jack Sparrow has proven to be quite the auteur, and he’s been supplying the world’s Mini Transat fans in the Ocean Racing forum with some awesome daily reports as the fleet heads towards Lanzarote. The big tracker is over here, and you can watch more than an hour’s worth of high-quality French TV coverage of the MT start – complete with star-studded commentary team – over on DailyMotion. 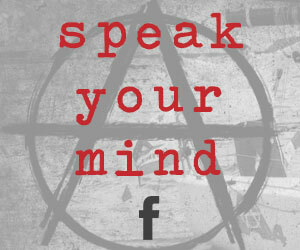 If you’re an English speaker and you love Minis, follow the MT thread for all the best bits. At the last report yesterday the fleet were negotiating Cape Finisterre and were lining up which side to leave the T Zone. Those that left it to port did not get much joy as the pressure increased inshore this morning. That last report also indicated that today’s wind increase along the Portugal coast would probably favour the front runners and it has panned out that way. 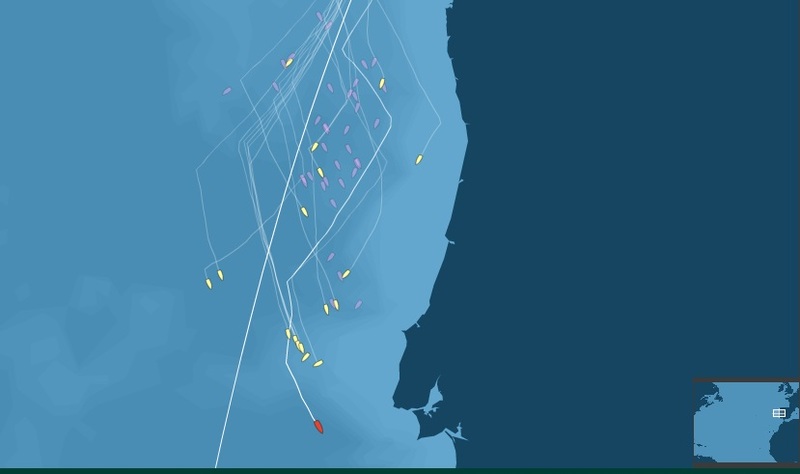 The rigours of the previous day in the Bay of Biscay was behind most of them. In the battle of the Prototypes, Davy Beaudart (FR) has gone from strength to strength, chasing the additional pressure sitting out on the left hand side alone earlier on and at 1300 UTC had just made his way past Lisbon. Sitting still some 30 plus mile in his wake Frederic Denis (FR) and Axel Tréhin (FR) have been in their own private arm wrestle swapping places at each sked. However this has occurred at a distance with Frederic favouring the left or eastern side along with Davy and Axel leading the others in from the other side of the rhumb line. This intense competition may have helped them close the gap slightly on Davy and stretch the gap over the following pack. The first interloper and Englishman Luke Berry (GB) has been steadily working away and is now sitting in 6th and less than 10 mile behind Frederic Denis (FR). The second gatecrasher to the Top 10 party, the Swiss Simon Koster (SUI) has not fared well. He has not only slipped back from leading this group early yesterday, but now sits in 9th and 30 mile behind Frederic Denis (FR). Simon appears to have made a conscious decision to keep to the right hand side. His thinking may be that there is little to be gained by following the leader and look instead to hold on to the breeze longer out wide, as it falls off as they edge further south. Time will tell if his gamble pays off. 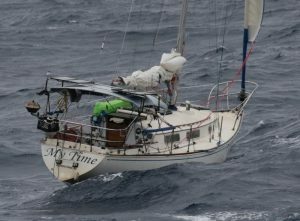 In the Production/Series, the leading French trio of Ian Lipinski (FR), Benedict Hantzperg (FR) and Tanguy Le Turquais (FR) managed to hold onto their positions over the last 24 hours and are nearly running their own race. Julien Pulve (FR) in 4th sits alone and unloved 10 mile back between those leaders and the next boat of Charly Fernbach (FR) in 5th which is some 25 mile behind Julien and leading the following pack. Most boats have now made their way over to the left side of the course and are enjoying excellent moderate downwind conditions gybing down the Portuguese coast with speeds ranging between 9 -13 knots. The weather map below shows the forecast for around midday tomorrow. 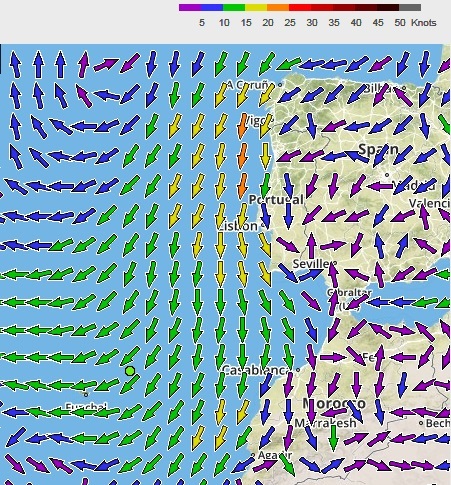 This indicates the leading boats will start losing breeze off the SW tip of Portugal. This will cause the fleet to compress and provide some joy to those out the back.